Thanks for bringing back good memories! Congrats on your sale! My hometown! Very nice shot and congrats on your sale! 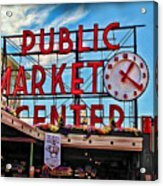 Pike Street Market as I have always known it, is one of my most favorite places to visit when I visit Seattle. Congrats on your sale Joan. Joan, Nice Work!..Congrats on your sale! Nicely done! Congratulations on your sale, Joan! Very cool Joan Well deserved congrats! Beautiful capture, Congrats on your sale! great shot Joan. Congrats on your sale. Congratulations, Joan. This is such a good one! Congratulations on your sale, Joan!! 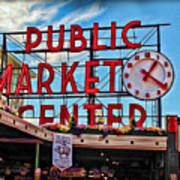 Pike Place Market is a public market on the waterfront in Seattle, Washington.. The Market opened in 1907, and is one of the oldest public farmers' markets in the USA. It is used by small farmers, crafts artists and merchants. 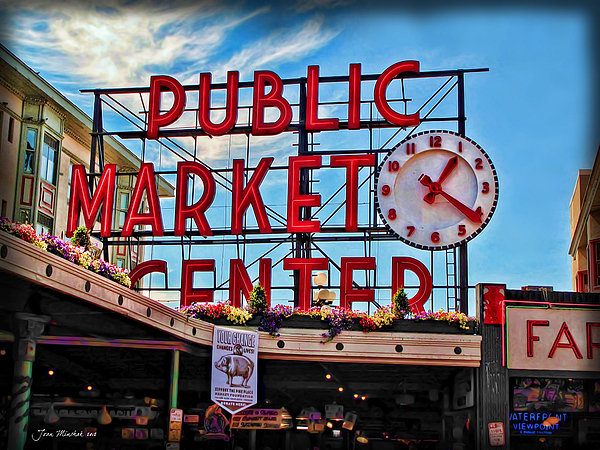 Pike Place runs northwest from Pike Street to Virginia Street. 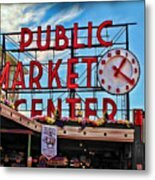 It remains one of Seattle's most popular tourist destinations. The Market consists of several lower levels located below the main level. A variety of unique shops are located there such as antique dealers, collectible shops, small family-owned restaurants, and unique artists. The upper street level contains a fish market, fresh produce stands and craft stall. They sell year-round in the arcades from tables they rent from the Market.